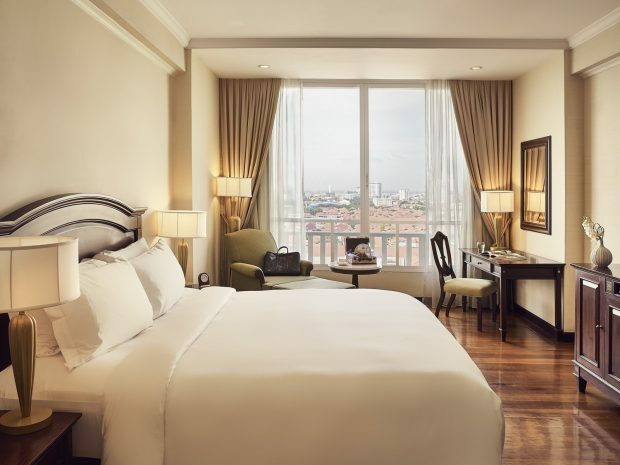 This elegant Phnom Penh hotel will provide you with a warm welcome and complete relaxation during your stay. The moment you arrive, Sofitel Ambassadors will ensure that your experience with us will be a smooth and seamless one. 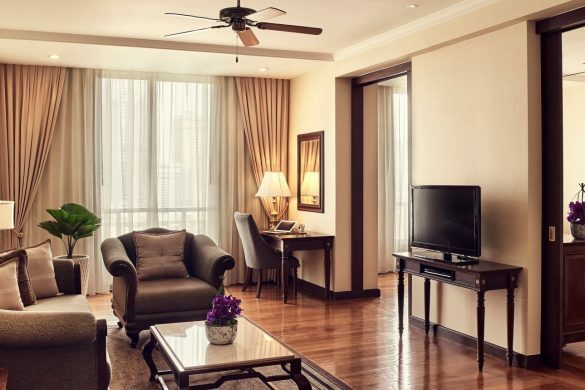 Your room or suite will be all that you have anticipated from a Cambodia luxury hotel, providing you with the perfect base from which to roam around the city. We are in close vicinity to a large-scale shopping mall, government offices, embassies, major tourist attractions, and of course the charming riverfront. 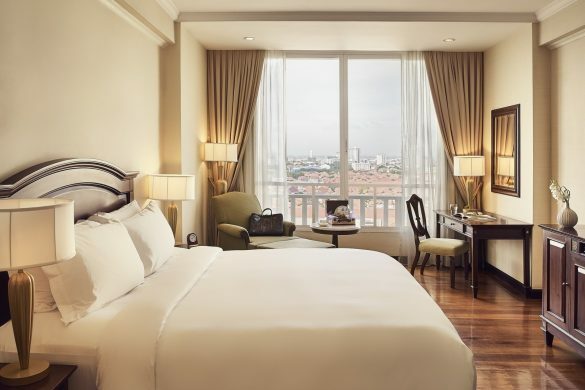 Sofitel regularly receives high praise on the Phnom Penh hotel TripAdvisor listing, and once you have stayed with us you will appreciate why. Do please check out our website because we offer a Best Rate Guarantee. When deciding where to stay in Phnom Penh, there are several factors to take into account. Leisure facilities are amongst them. Excellence in dining is most important, and we have four restaurants from which to choose. La Coupole is for breakfast, lunch and dinner, and features live cooking stations, champagne brunches, and fabulous international buffets. Hachi is for fine Japanese cuisine, Fu Lu Zu is an elegant Chinese restaurant serving regional specialities and dim sum, while Do Forni has an authentic Italian menu. Add to this the cosy Le Bar , and the Aqua and Sports Bar , where you can relax with a refreshing drink and light meal beside your swimming pool in Phnom Penh, and you will really appreciate living in style. 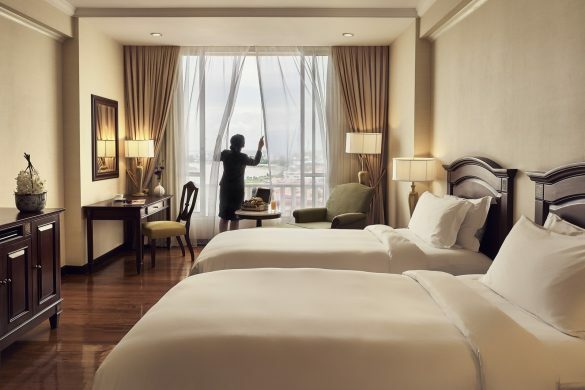 As a Phnom Penh luxury hotel, we offer the finest guestrooms in the city. Our Superior Room has a full 40sqm of space, and is fitted out with a timeless colonial style and elegance. A restful sleep is assured on our own-brand Sofitel MyBed, which is available in king or twin bed options. Your room has a 42-inch flat-screen LCD TV, a DVD player, writing desk, and minibar. The large bathroom has separate shower and bathtub, and Lanvin luxury bathroom amenities are included. Our best-selling accommodation is the Luxury Room , which has a very spacious 47sqm of living area and its own private balcony. The amenities are the same as those of the Superior Room, and this room category is available with access to all the benefits of Club Millesime. Our Club Rooms are located on the highest floors of the hotel, and provide the most gorgeous of river views. The Superior Club Room has a generous 40sqm of space, and is fitted out in an evocative colonial style. Sofitel MyBed options offer either king or twin beds, there is a minibar, 42-inch flat-screen LCD TV, and DVD player. The large bathroom has separate shower and bathtub, and Lanvin luxury amenities are provided. 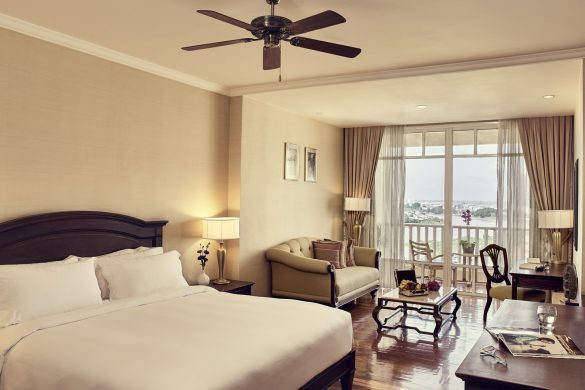 The Luxury Club Room has a gracious 47sqm of space, with a private balcony from which to gaze out over the Mekong River, one of the deciding factors when choosing a hotel in Phnom Penh. The amenities are the same as those of the Superior Club Room, and of course both room categories have all the benefits of Club Millesime. Our luxury Phnom Penh hotel naturally offers fine suite accommodation. 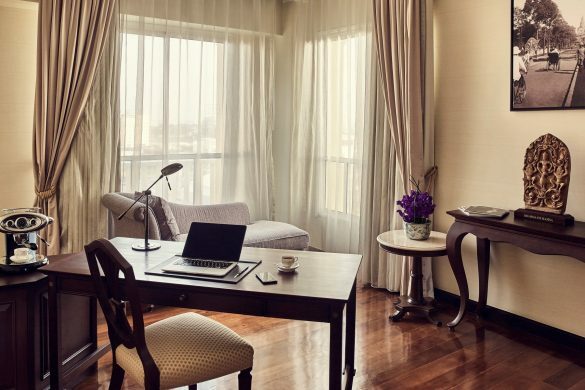 Our Junior Suite is designed both for enjoying holidays with your loved ones as well as for business travellers, and feature a desk that allows working in the most comfortable of surroundings. The Prestige Suites have an enormous 94sqm of space, which is divided into separate living space and lounge, along with bedroom. Located in every corner of the hotel building between the 9th and 11th floors, these suites have beautiful views over the garden and city. Separate shower and Jacuzzi are in the large marble bathroom. 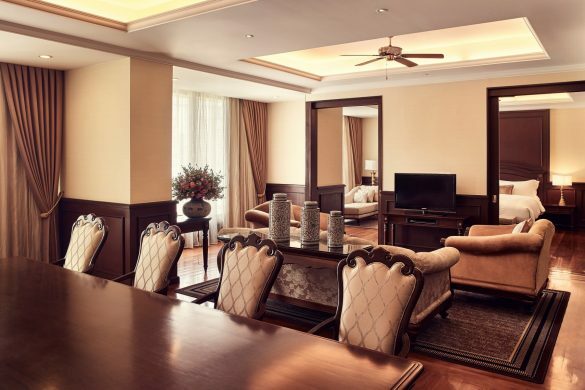 The Opera Suite is our top-level accommodation, with 140sqm of space encompassing dining room and pantry, living room, and spacious bathrooms with walk-in closet.